Here in Chicago, we're familiar with the art of barrel-aging a beer. The modern style's pioneer, Goose Island, has taken this art to the next level with their Bourbon County and Sour Sisters series, resulting in some of the finest, and booziest beers we've ever come across. Across the pond, the British craft beer scene is experiencing their own renaissance. Blending together hundreds of years of beer history with modern techniques, some truely unique British brews are hitting our shores. Innis & Gunn has a founding story unlike any other brewery. In a sense, you were a product of a request made by distiller William Grant. Can you tell us a little about how the brewery came into existence? Working with William Grant & Sons was the start of our journey. The distillery asked me to make a special beer for them that they would use to season whisky barrels before filling them. After a few weeks of seasoning in the barrels, the beer was drained. But the distillery manager called me and said, “I think you should come over here and see something.” The crew was filling empty water bottles with the beer and taking it home to drink it. They loved it. I tried the beer and it was fantastic. It was the eureka moment for me on oak aging beer. It resulted in our first brew, Innis & Gunn Original. From there I decided to set out on my own and focus solely on oak-aged beers. They were very supportive of that move and my pursuing that dream. I led a buyout of the joint venture we had with Grant’s and began brewing Innis & Gunn Original out of Caledonian in Edinburgh. That was the brewery where I had worked for my dad – I practically grew up in that brewery. We quickly went on to develop more beers and moved our brewing to Wellpark Brewery in Glasgow, where we still brew most of our beers today. But our start came from an unexpected and thoroughly accidental discovery, and I’m thankful for it. What was the path that led you to become the Master Brewer of your own brewery? What were you doing before this? I spent school holidays working for my dad at The Caledonian Brewery, learning everything I could–sometimes under duress!–and I helped re-build the brewery on two occasions when it was damaged by fire. I started there when I was just 14. I think my dad liked my cheap labor. Over the years I worked my way up to Head Brewer at Caledonian, and went to college and earned a chemistry degree along the way. Before leaving and focusing on Innis & Gunn, I revamped the recipes there and added a focus on getting the most flavorful ingredients we could, all to build the flavor of the beers. One of those revamped beers, Deuchars IPA, was crowned as the "Champion Beer of Britain." I’m especially proud of that one. That beer revolutionized the beer scene in Scotland. I suppose you could say making beer is in my blood and it’s what gets me out of bed in the morning. You're entering a Chicago market renowned for barrel aged beers (ex. Goose Island's pioneering BCBS). 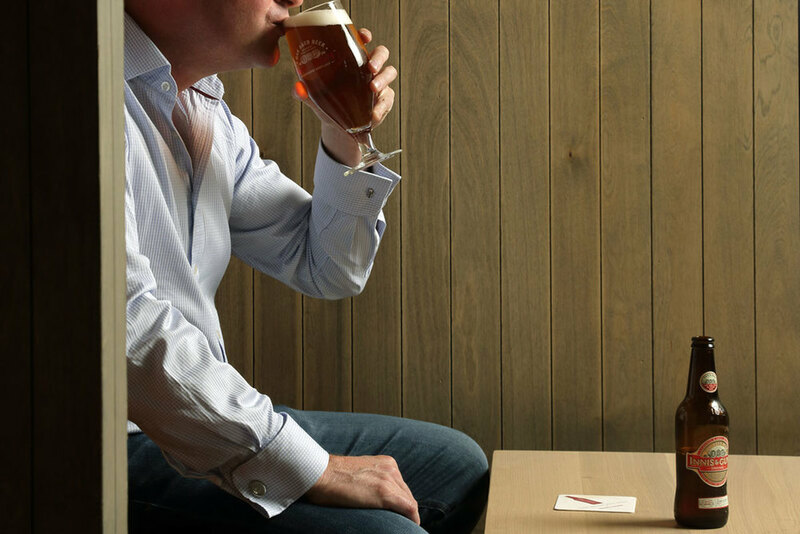 What sets apart Innis & Gunn's portfolio from the rest? Why should people try an Innis & Gunn? I think our flavor profile is unique. We’ve always been about flavor from day one. What sets us apart? We come at this with a Scottish and UK sensibility, of course, and we use the best malts and hops we can get from our local sources. From our house base malt to our hops and yeast, we take no shortcuts. It’s got to be the highest quality. So there’s a different terroir, if you will, that reflects our heritage, methods and ingredients. But our beers are quite different from the barrel-aged beers most American craft drinkers are familiar with. We’re after a balance of flavors, a balance of the beer and the wood and spirit. We don’t want to punch you in the mouth with oak and alcohol and heft. So our beers have less of the heaviness and the wallop of wood and alcohol people expect in an American barrel-aged beer. It’s an outstanding beer first, that’s enhanced by wood and spirits aging. Our beers are also of a lower ABV than most oak-aged US beers, and those alcohol levels are well-hidden among the flavors of the beers. And they feature a more gentle, softer carbonation. That’s very important. Carbon dioxide is acidic and plays a major role in the flavor of beer. We go to great lengths to make exceptional beer, so we don’t want to undermine that with harsh carbonation. All of which makes our beers super drinkable for any occasion. To use a term increasingly popular in the US, our oak-aged beers are very “sessionable.” That’s maybe our biggest distinction for US beer lovers. We make artful oak-aged craft beers of great depth and character, but they are approachable and it’s not a labor to drink them! What does it mean to you to enter the Chicago market? Any Windy City breweries that excite you? Well it’s a great American city and a great craft beer town, so that’s exciting for us. And you have an educated beer consumer base that will understand our beers, so that’s another plus. With Goose Island’s history there, beer drinkers are certainly familiar with the merits of barrel-aged and oak-aged beers, so that will be good for us as well. Breweries? Two Brothers is one with much history and roots there, and I’ve heard great things about Piece Brewery. And Randy Mosher is a legend there and involved in a couple of breweries [Five Rabbit and Forbidden Root] that are doing some fantastic beers with exotic ingredients and methods. It’s exciting for us to be among such beers there in Chicago. How do you manage efficiency (in energy and business) with such an expanding footprint? From the big-picture standpoint, I work with an exceptional team and the people we have are as passionate as I am about changing the world of beer for the better. That’s been crucial to our success. We’ve also been smart about the markets we’ve expanded into. Canada and Sweden were two of our first export markets and our beers have done especially well there. In part because those are nations that love great beer, great whisky, and Scotland. So our beers hit all of the right buttons for people there. The help in our early days from William Grant was also very valuable as well. Today we are thoughtful about the new markets we choose, and that’s helped a great deal. Making delicious, very high quality beer, that has been our biggest asset for expanding our reach! How are barrel-aged beers perceived differently in the UK versus the US? Are they becoming more widely accepted or are they still a niche product? It’s definitely still a niche thing. But there is a real growth in awareness and usage in the UK from brewers, which can only be a good thing. That growth helps to enlighten more people about the type of beers we do. We’ve been making oak-aged craft beer since 2003, ages ago by craft beer standards, especially in Scotland. So we’ve been very much ahead of the curve here and being a pioneer comes with some challenges. But craft beer is exploding here now and more beer drinkers are seeking fuller and new flavors, so that is much less of a challenge for us now. Can you describe your "perfect" barrel used to barrel age your beer? It depends what beer you are making! And each barrel can impart a slightly different taste and richness. But we’ve certainly had some great successes with beers aged in whisky barrels from here in Scotland, Ireland and the US. Aside from Scotch barrels, you've used rum barrels as well as some limited releases in Bourbon barrels. Can you speak to the differences and maybe your personal preferences between different liquor barrels? They impart noticeably different flavors, rum gives more of a fruity slightly sweet note on the aroma and a full bodied taste with a smoother mouth feel than Bourbon. The Bourbon casks though produce a drinkability that comes with slightly less sweetness. But in terms of favorite – it has to be rum, all the way. What kind of whisky drinker are you? I’m partial to a dram of Auchentoshan 3 Wood. For someone who has never tried the beer, what flavors should he/she be looking for on the first sip? Vanilla, toffee, marzipan, cloves... it depends on which beer but these flavors tend to come out from the oak chips. But when you infuse the oak with spirits, that’s when the flavors really bloom and come to life, and create the interplay between malts and oaks and whisky – or rum or other spirits. The spirits unlock the flavor of the woods. By aging our beers on the combination of the two, we are able to create a beer that is truly unique and outstanding. Our beers are also showcases for malt more than hops because that combination yields the best of that magic. We also have a long history in Scotland of understanding the importance of malt in a great beer. But to get back to the oak, that’s key. It serves as a scaffolding of sorts for the beer, it gives the beer structure. It extends the flavours of the beer. Again, balance is vitally important. It allows you to enjoy all of the aspects of the beer. We don’t want one flavor overpowering the rest of them. It’s like a band. If the drums overpower the guitars, it doesn’t work. Have you brewed any beers where the oak did not lend a positive to the flavor, perhaps a beer that was better without the oak? When you are a craft brewer and experimenting and trying new things, some things turn out better than others! It comes with the turf. I don’t think we’ve had any flops. But the best of our beers become year-round or seasonal offerings and we make sure they stick around in some fashion. Our new winter seasonal, Bourbon Aged Dark Ale, has quickly become a favorite of ours and because of that we’re going to make it a year-round beer for the US in 2016. Will you ever brew a 'non-oaken' beer? Yes absolutely – we have an un-oaked lager which recently won a gold medal at The World Beer Awards. It’s very good to be honest. It took us longer than expected to nail the recipe and the right levels of bitterness but it was worth it. We make it with golden naked oats, which add a nice subtle sweetness and roundness to the beer As far as lagers go, the taste is really unique – it’s light, refreshing and flavorful but with a smooth finish. It has quickly become a hit in Scotland and we’re considering sending a bit of it to our other markets. Due to the extended oak processing, does this restrict how much beer you can get out into the market, possibly stunting the brewery's growth? Absolutely. As I mentioned earlier, we started out as a barrel-aged beer maker. But as we started winning awards for our beers and our sales grew, it became more and more difficult to find oak barrels. This was a problem we addressed a few years back and in 2010 we developed our 'Oakerators' – a method of oak-aging our beers in as efficient a way as possible exactly for this reason. The process is a bit like a coffee percolator, which in theory is about us putting the barrel into the beer not the other way around. We use 24 month air dried American oak heartwood chips, of various levels of toast, which are infused with a spirit, either a bourbon, spiced rum etc. The Oakerator effectively allows us to get exactly the same flavor profile–and often times even better flavors–as if our beer was barrel-aged. Without being limited by the supply of barrels and without the problems of sourcing and shipping barrels. The Oakerator has been vital to our success. It’s allowed us to keep up with demand and get more Innis & Gunn beer to our customers while maintaining the quality and flavor of our beer. It’s actually increased the rate of awards and accolades we win from the world’s best beer judges and contests. In the past six months our core beers have all won medals in the US Open Beer Championships, the World Beer Championships and the International Beer Challenge. That’s quite a feat, isn’t it? We’re using our brains and the best technology we can come up with to make the best, most flavorful beer we can make for our customers. For barrel-aged beers, these brews have a surprisingly low average ABV. This is by design, I presume? It depends what you call low?! At 6.8% for the Rum Aged and 6% for our Bourbon Pale Ale they aren’t short on punch! We have also done a spiced rum at 7.4% and our Bourbon Dark is 7.4 as well. Our flagship sits at 6.6 % ABV, no slouch there either. But all of our beers taste as if their ABV is even much lower and that’s certainly by design. That’s where the brewer’s art comes in, that weaving in of the alcohol among the flavors of the beers. Our aging and gentle carbonation add to that drinkability. But compared to American-made barrel-aged beer, yes, ours are lower in alcohol. But as I mentioned before, that’s one of their strongpoints for beer lovers in the States. That’s one of the things our fans love about our beers. You get a range of barrel-aged flavors in a more refreshing, quaffable beer. Most of our beers come in single-serve bottles too, not bombers or 750s, so that adds to their sessionable appeal. I love to meet people who say they don’t like barrel-aged beers or beers aged on wood. “They’re too strong, too much, over the top.” Then they try our beers. “Wow. That’s delicious.” They’re now converted. We’ve made believers of them for life. But you know, in Scotland we have a long history of making superb beers that are rich with flavor but low on alcohol. It’s in our DNA now. It’s easy to find delicious beers in a pub here and in the UK that are under 4% ABV. That’s something brewers here mastered long ago. What many call a “session beer” is simply “beer” to us. Any plans to ever "double-barrel-age" a brew? Age in the young barrels, pass off to the whisky distiller, then reuse the barrel after to continue to age, for a limited release perhaps? Never say never, we are always looking at innovative ideas for our next brew – could be good! The packaging and design for the beer lineup is truly beautiful. Can you speak a little to the importance of such a strong identity system? – Your packaging hints at a strong heritage-able quality, yet the brewery is surprisingly only 13 years old. We think that's very telling of the I&G brand and the seriousness in your craft. From a mere packaging standpoint, did you feel a need to position Innis & Gunn as a more mature brand, to adjust to other, older, British beer brands? Our brand identity was always key for me from day one. We spent a great deal of time in the early days really landing packaging that conveyed real quality and craft. With that in mind, it’s not to say we won’t play around with ideas in the future to keep things fresh. Your packaging was recently reconsidered also, correct? Yes, exactly – we changed over from clear glass to amber last year. The point of the clear bottles was to showcase the color of the beer to the consumer and give them that information when deciding what to purchase. But consumers like the protection and peace of mind that an amber bottle provides, and so do we. So we made the switch to amber glass. 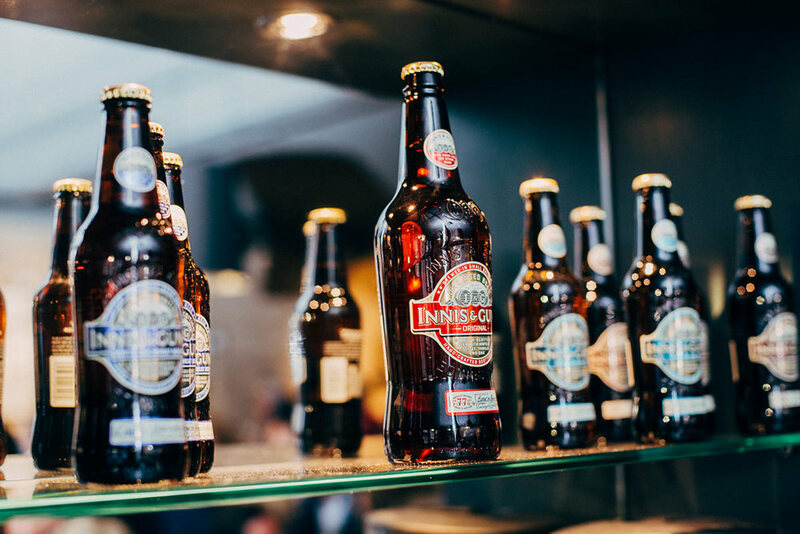 Since you founded the company in 2002, Innis & Gunn has grown by leaps and bounds. What would you attribute to this success (other than just good beer)? The people in our business, the beers we make and the amazing partners we have worked with. And smart decisions on where to expand and grow our reach. What does Innis & Gunn look like in a year? Definitely more beers, more bars, more laughs. Oh, and our new brewery. Earlier this year we completed a round of fundraising thru Beer Bonds toward funding that new brewery. That facility will allow us to make more beers, experiment more, expand our barrel-aging efforts, do some collaborative beers with other brewers, create more excitement and fun. Can you describe the Scottish craft beer scene, does it take more cues from the American craft explosion, or traditional old world styles of Europe? In a word: exciting. It’s a growing industry – there’s now over 100 brewers and counting. I think the craft boom in the UK definitely takes influence from both the US scene’s distinctive beers and also European styles. There’s lots going on and it’s a great time to be making beers. Your brewing facility is in Glasgow, while your offices are in Edinburgh. How does the drinking culture differ in each city? Glasgow has really come into its own in recent years with more interest in craft but it is still predominantly a lager drinking city. Edinburgh has some brilliant craft beer bars–including our own, The Beer Kitchen–and there is a real thirst for quality, interesting beers. 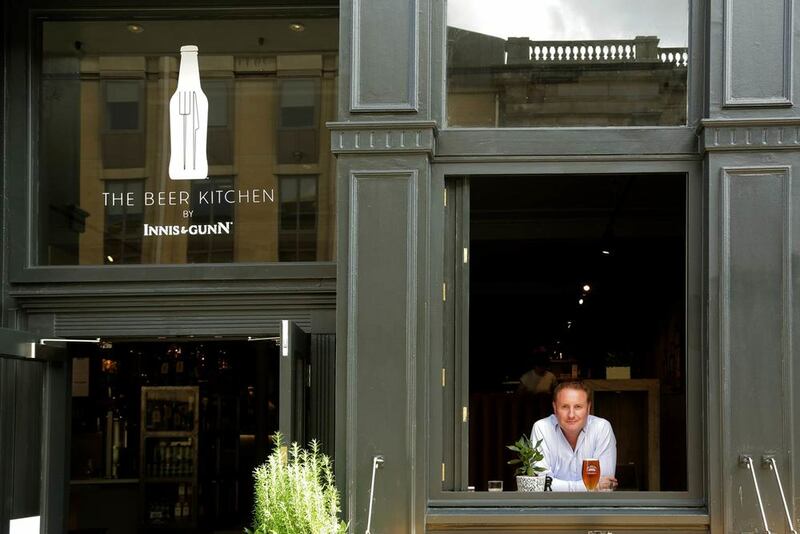 Yea, can you tell us more about the Innis & Gunn "Beer Kitchen?" It's a beautiful, and unique, outpost for your brewery. 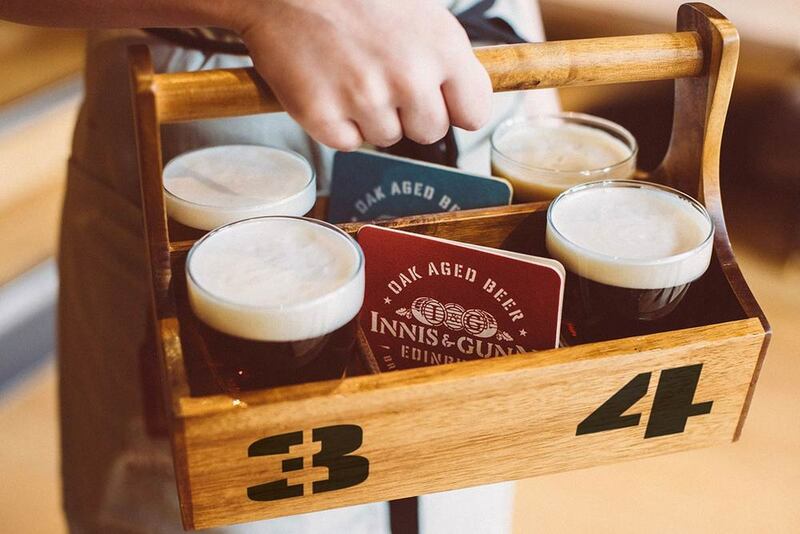 Our fans had been crying out for our own bars for some time and this venture is our new craft beer ‘soap box’. We want to open beer drinkers’ eyes to what craft means and what real beer tastes like. There’s no room or excuse for second rate, tasteless beer and we only stock and serve incredible brews we absolutely love and believe in. From local beers in Scotland to beers from the US and around the world. We’re also on a mission to elevate the concept of beer & food pairing. It’s not as far along in the UK as it is in the US, so we are doing our part to educate people to the idea. All of our food is crafted with great beer in mind. So far The Beer Kitchen has been a hit. We are going to open more of them here. It’s our new tool for raising the profile of beer to a higher place and elevating beer culture in general. What is Dougal Sharp drinking when not at the brewery? Probably one of the boiler makers we serve at our bar in Edinburgh. What does it mean to you and your brewing path to have your signature on the bottle? It serves as a constant reminder that every bottle must be of the absolute best quality and flavor. Photography provided by Innis & Gunn.